The MDG Gap Task Force was created by the Secretary-General of the United Nations in May 2007 to improve monitoring of the global commitments contained in MDG 8, the Global Partnership for Development. The main purpose of the Task Force is to systematically track existing international commitments and to identify gaps and obstacles in their fulfillment at the international and country level in the areas of official development assistance, market access (trade), debt relief, access to essential medicines and new technologies. Access MDG Gap Task Force reports (2008-2012). The Task Force integrates more than 20 UN agencies, the International Monetary Fund (IMF), the Organization for Economic Co-operation and Development (OECD), the World Bank and the World Trade Organization (WTO). The United Nations Development Programme (UNDP) and the Department of Economic and Social Affairs of the United Nations Secretariat (UN/DESA) are the lead agencies in coordinating the work of the Task Force. 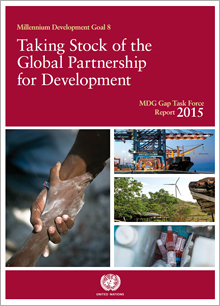 Learn more about the MDG Gap Task Force.